On this page is where you can go swimming with dolphins in Florida. 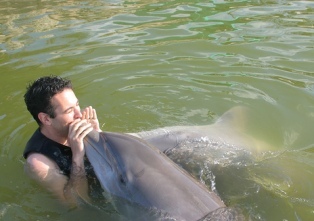 Dolphins are very friendly animals and enjoy swimming with you as much as you enjoy swimming with them. They are curious, will check you out and swim around you. And Florida is an excellent place to do it, with many places to choose from, such as Dolphin Research Centre in Florida Keys, Seaquarium in Miami, Discovery Cove in Orlando, Dolphin Plus and Dolphin Cove in Key Largo. You can also join a dolphin swimming tour that takes you out to the sea where your can get off the boat and have a swim with these amazing animals in their real wild habitat.